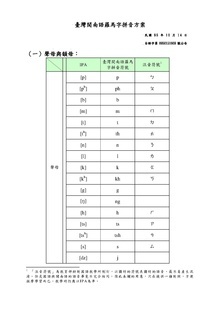 Taiwanese Romanization System uses 16 basic Latin letters (A, B, E, G, H, I, J, K, L, M, N, O, P, S, T, U), 7 digraphs (Kh, Ng, nn, Oo, Ph, Th, Ts) and a trigraph (Tsh). In addition, it uses 6 diacritics to represent tones. "nn" is only used after a vowel to express nasalization, so it has no capital letter. Palatalization occurs when "j, s, ts, tsh" are followed by "i", so "ji, si, tsi, tshi" are sometimes governed as trigraphs and tetragraphs. Of the 10 unused basic Latin letters, "R" is sometimes used to express dialectal vowels (somewhat similar to erhua), while the others (C, D, F, Q, V, W, X, Y, Z) are only used in loanwords. o pronounced [ə] ㄜ in general dialect in Kaohsiung and Tainan, [o] ㄛ in Taipei. There is also syllabic m and ng. ing pronounced [ɪəŋ], ik pronounced [ɪək̚]. A hyphen links elements of a compound word. A double hyphen indicates that the following syllable has a neutral tone and therefore that the preceding syllable does not undergo tone sandhi. ^ Cheng Jei-cheng (2008). Taiwan Minnanyu Luomazi Pinyin Fang'an Shiyong Shouce 臺灣閩南語羅馬字拼音方案使用手冊 [Practical Manual for the Taiwan Southern Min Romanization System] (PDF) (in Chinese) (2nd ed.). ROC Ministry of Education. ISBN 978-986-01-6637-8. ^ 臺灣閩南語羅馬字拼音方案使用手冊 (PDF) (in Chinese). 2007. ISBN 978-986-00-7755-1.